Underwater seascape of shells, fish, and coral painited on fabric. Multiple drawings are included for the various components which can be used together or separately. Enlarged or reduced to fit your surface. 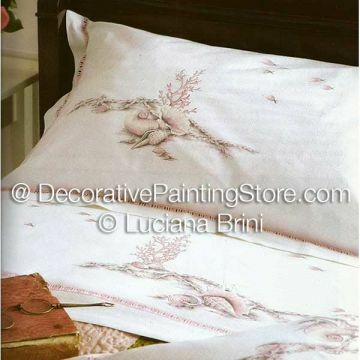 Luciana has painted the design on a pillow case and sheet, but it is adaptable to a variety of surfaces. Pattern includes photo, instructions, line drawing.